Why would I need self storage in Annapolis, MD? There are a variety of reasons why you might need self-storage in Annapolis, MD. How much is a storage unit in Annapolis, MD? The cheapest storage unit in Annapolis, MD is $108.00 per month. What size storage units do you have available in Annapolis, MD? In Annapolis, MD we have sizes that range from 10'x5' to 10'x15' to suit your storage needs. How much is it for a 10'x5' storage unit in Annapolis, MD? The cheapest 10'x5' storage unit in Annapolis, MD is $113.00 per month. 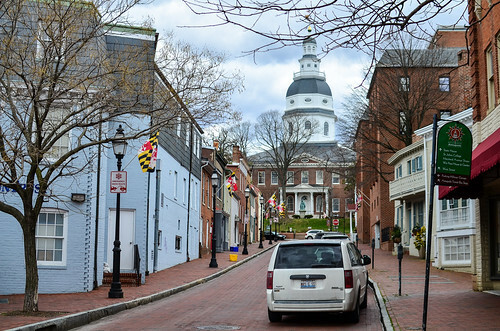 Annapolis is a midsize Maryland city about 30 miles east of Washington D.C. It's the Maryland state capital and part of the Baltimore and D.C. metro area. With a history dating to the 18th century, it's a popular destination with numerous attractions enjoyed by visitors and locals alike. Baltimore's best-known attractions include the Maryland State House, Naval Academy and city dock. Popular local activities include browsing local art galleries, attending symphony performances and enjoying a day of sailing in the warmer seasons. If you're looking for something more rural, you can head to the Annapolis countryside, which offers a scenic bay, horseback riding and a maritime village. Like many East Coast cities, Annapolis can trace its founding to the 17th century. It was officially incorporated in 1708, though it was just a small community at that point. Up through the onset of the Revolutionary War, Annapolis grew and developed rapidly, serving as a major port of entry and an administrative and political capital. It's location on the water helped fuel thriving sail-making, boat-building and oyster-packing industries. Over the decades, Annapolis was a part of many historic events, including hosting a Civil War prisoner-of-war camp. Between 1840 and 1968, the city was part of a larger railroad transit network operated by the Washington, Baltimore and Annapolis Railroad. This helped bring business and new people to the Annapolis area, contributing to its ongoing growth. Within an hour of both Baltimore and Washington, D.C., Annapolis is located in a highly desirable area. Public transportation via the Maryland Transit Administration is available to both destinations, making them viable options if you're looking for a job. However, you don't have to leave the city to find job prospects - Annapolis has plenty to offer close to home. There are several major employers in the city, the largest of which are Anne Arundel Medical Center, the U.S. Naval Academy and ARINC. Retailers such as Home Depot offer a range of sales and customer service positions, while communications companies such as Verizon, AT&T and TeleCommunication Systems also provide hundreds of local jobs. Annapolis has a balance of public and private schools, providing a range of educational options to meet all preferences and needs. The Anne Arundel County Public Schools System is responsible for the city's public schools, while private schools are operated by a variety of entities, including local churches. Utilities: Major utilities providers in the area include Baltimore Gas & Electric and Annapolis Public Works. Garbage and Recycling: The city is split into several collection zones for trash, recycling and yard waste. Transportation: Intercity transportation is referred to as Annapolis Transit and includes a series of routes that travel between most of the city's major shopping centers, parks, schools and medical facilities. If you need transportation around the metro area, you can use the MTA commuter buses. Driver's Licenses: You have 60 days from your move date to obtain a Maryland driver's license. Housing prices in Annapolis are well above average, which is not surprising for a centrally-located city on the East Coast. However, properties are split fairly evenly between those for purchase and those for rent, so you can choose the option that best fits your budget. There's everything from studio apartments to massive estates on several acres, so the Annapolis housing market has something for everyone. Our lowest priced units in Annapolis, MD average $110.50 per month. 71 people have reserved units in Annapolis, MD in the past 30 days. There are 2 locations within Annapolis, MD's city limits. There are 2 locations in Annapolis, MD that offer AC and Heating features.